There’s nothing better than a BBQ, except when you do it on an outdoor kitchen island. Spice up your next get together with a unique island that lets you entertain as you cook. Having an outdoor kitchen will make you the envy of all that you entertain. With summer fast approaching, the time is now to spice up your next barbecue with an outdoor kitchen island. A custom outdoor kitchen will go a long way towards ensuring that you are the envy of every one of your guests. Whether it is a small space dedicated to outdoor cooking, or a full blown kitchen with a sink, refrigerator, and fire feature, the only limitation to what can be accomplished with an outdoor kitchen is your imagination. Outdoor kitchens can be customized to the exact needs for a chef’s culinary masterpiece. The first thing that should be done is to pick a spot for the outdoor kitchen. Some questions to ask consider are: Do I want to make it a part of my patio or deck? Do I want a separate space? Do I want a pergola or roof over it? Do I want it enclosed? You will need to think about these things as you pick your spot. For example, if you want a roof, you will want to ensure the spot you have picked does not have any power lines over it. Once you have your spot picked out for your outdoor kitchen you will need to decide what size it will be. After you decide on a size, just mark off the spot with stakes and strings to make sure it will fit in that spot and account for any changes that might need to be made. If there is anything that needs to be changed, now is the time to discover it. 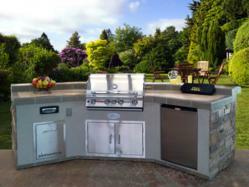 So, what options do you want in your outdoor kitchen? Some of the more popular choices are a refrigerator, sink, and fire features made just for the outdoors. Some outdoor kitchens are basically a built in grill with extra counter for prep space. Others are more like a full blown kitchen, just like those found in a house. Yours can be as basic or as spectacular as you decide to make it. When you choose your appliances for your outdoor kitchens, just remember stainless is king. All equipment and hardware should be made from stainless steel so it’ll last for years. As to some of the other options, you will need to choose based on the design that you have chosen for your outdoor kitchen. A bar counter is a great way to add extra seating in your area as well as entertain while cooking. As far as what type of countertop you choose, tile or granite are both durable outdoor materials that can withstand the weather and still look beautiful. Finish is also important. Do you want a Stucco look or Stone finish? With so many things to choose from, it’s best to seek the advice of a professional when designing. Whatever you decide to include in your outdoor kitchen, you can make it as unique as you are! For more information about Best in Backyards go to https://www.bestinbackyards.com, visit one of six locations or call 1-800-752-9787. 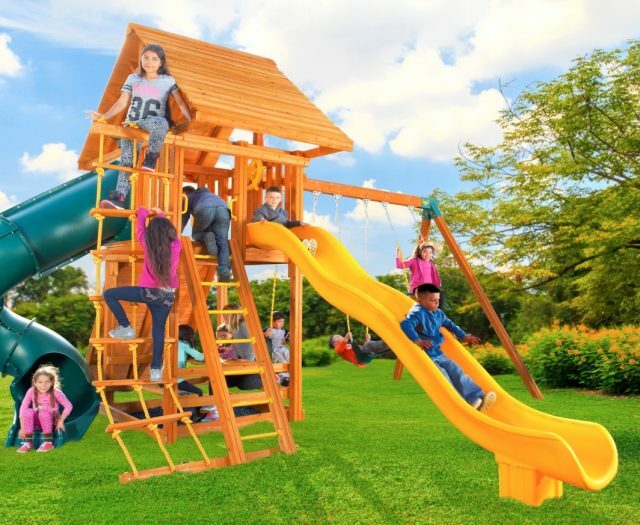 Best in Backyards is the retail arm and showroom brand of Eastern Jungle Gym, one of the leading producers and suppliers of outdoor swing sets. The company was founded over 20 years ago by a family with intent to manufacture high quality cedar swing sets, fit to fill any backyard and last a lifetime. The company is located in the northeastern United States with retail showrooms currently located in New York and Connecticut. 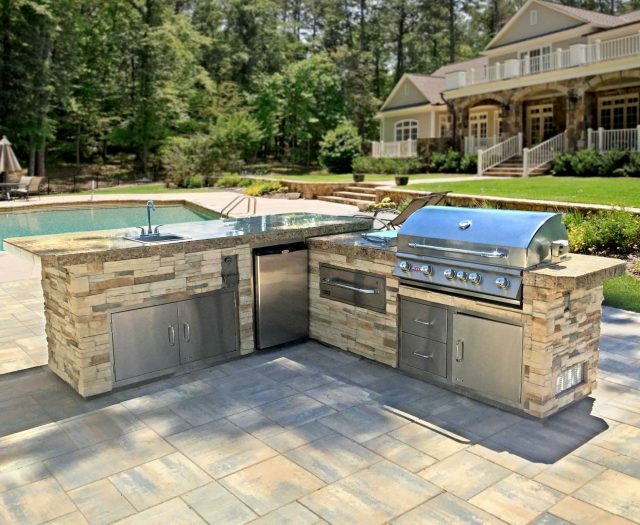 Best in Backyards is now offering new outdoor kitchen islands at their six showroom locations in Connecticut and New York. The islands are offered for all sizes and spaces and will provide customers with an amazing outdoor summer BBQ experience. Envision a man standing alongside a flaming grill in a funny apron, burger flipper in one hand and tongs in the other. Best in Backyards is announcing their new outdoor kitchens islands that are now available in at their six showroom locations across New York and Connecticut. Envision a man standing alongside a flaming grill in a funny apron, burger flipper in one hand and tongs in the other. This is a stereotypical picture that defines most homeowners’ views of cooking outdoors. In today’s world, homeowners are looking for items seen in kitchens to be a part of their outdoor space – grills, counter space, storage, sinks and refrigerators. Homeowners are reconnecting with their backyard like never before; some even want entertainment systems like stereos and TV’s to spice up the back patio. “The rise in the popularity of outdoor kitchens is in direct response to the economy. People can’t afford to move into bigger homes,” says Zimmermann. He also says the appeal of outdoor kitchens is that it combines indoor and outdoor living like never before. “People want to enhance their lifestyle and enjoy their lives in the home they have. They want it to look like their indoor living room, but they want to sit outside. It’s all about increasing livable space in the current home,” says Zimmermann. Outdoor kitchens have become popular because they offer added enjoyment, luxury and relaxation for the homeowner. They expand a home’s livable square footage and their return on investment is comparable to an indoor kitchen remodel. No matter what the customer’s budget or outdoor cooking needs may be, Best in Backyards has an option available. 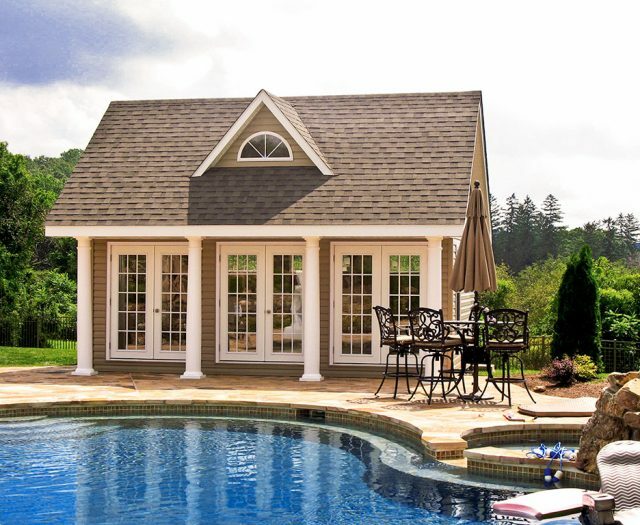 For more information on these and many other products at Best in Backyards go tohttps://www.bestinbackyards.com, visit one of six locations or call 1-800-752-9787.